In recent years, electronic devices are equipped to have higher mobility. Battery preferment has fueled the progression in a variety of products like wireless speakers and portable power tools. In today’s world, the efficiency of the batter has radically improved. Mostly, batteries are fitted with a state-of-charge gauge that indicates the remaining charge. However, the readout would be incomplete without tracking the battery’s capacity as it fades. In this article, I will give you to a closer look at Battery Management System (BMS). BMS can be well defined as the brain behind the functionality of the battery packs. It controls the charging and discharging of a battery. In other words, Battery Management System is an acute electronic regulator that controls and monitors the charge and discharge of rechargeable batteries. It measures the voltage and it will automatically stop charging once the desired voltage is achieved. A BMS is usually built with a smart battery pack which must be charged by a smart battery charger. In such case, they might cut short the power flow. Also, it will issue an alarm in the event of dangerous or irregular conditions. This method concentrates on compensating weaker cells by balancing the charge on all cells, which aims to extend the battery life. Every charge-discharge cycle tends to magnify the small differences in the multi-cell batteries. When being charged, the weak cells might get overstressed. They may become weaker and eventually fail, which causes the battery to fail prematurely. At this point, the BMS provides a dynamic solution by incorporating one of the three cell-balancing techniques prevent cells from getting overstressed and equalizing them. Additionally, the function can also get enhanced by communications channel that carries system control signals. The application of the battery determines the communication protocol. 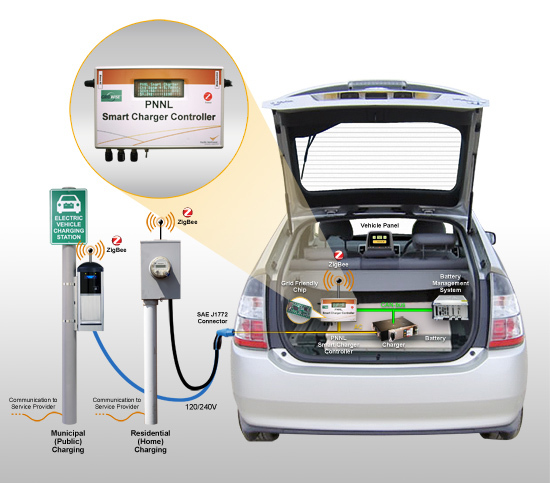 The battery system fitted in electric vehicles is required to communicate with the motor and upper vehicles controllers to enable seamless operation of the car. When charging, the charger produces the constant current that helps in increasing the battery voltage. Once the desired voltage is achieved, the battery becomes almost full. Then, it gets to the final stage (constant voltage). At this point, battery voltage remains constant as the current continually decays until charging stops. Direct measurement involves using a voltmeter since the battery voltage reduces during the discharging process. The coulomb-counting method integrates the current going in and out of the battery to create a relative value of the charge. The two methods can be combined. The voltmeter will be used to monitor the voltage. The battery current would be integrated to measure the current going in and out of the battery. Charging the battery inappropriately will weaken and shorten its lifespan. Therefore, Battery Management System ensures that the battery does not operate out of its safety zone. Moreover, it protects the cells from any eventuality when discharging. It’s one of the functional blocks that tracks the charge entering and leaving the BMS battery. The charge is the product of time and current. Various techniques can be used to design the fuel gauge. An MCU explicitly designed with the low-resolution converter and a current-sense amplifier is one of the current fuel gauge methods. The amplifier operates in the high common-mode ground. It also amplifies the signal. However, the most cost-effective and accurate solution is to gauge the voltage across a sense resistor with a higher ADC or a 16-bit. FET drivers can be architected to connect low or high side of the battery pack. The low-side connections are majorly found in integrated solution, which reduces the cost since the battery can then function without a charge pump. On the other hand, high-side FET driver’s connections need a charge pump for the NMOS FETs activation. Monitoring and controlling the cell voltage of every cell in the pack is vital to determine its holistic health. There is a voltage window that controls charging and discharging of the battery, which ensures seamless operation occurs. Remember, if you operate a battery outside the voltage range, you will reduce its lifetime and eventually render it useless. In most cases, BMS requires an MCU (microcontroller) or FPGA which controls information from sensing the circuitry and eventually making informed decisions with the received data. A digitally encoded algorithm is used in certain devices to activate the standalone solution using one chip. Batteries are increasingly playing a vital role in the modern world. The rise of mobile technology and electric cars has increased the demand for wireless power. Today, batteries have become essential than ever before. Therefore, having a proper BMS is valuable. Loss of battery power can lead to massive loss and is dangerous. That’s is why it’s essential to have a BMS to ensure that batteries function properly as designed.